Though billed as a key benefit of online grocery shopping, convenience remains a gap to be bridged for many consumers, new research from Bain & Co. and Google finds. Of consumers who have shopped online for groceries once in the past 12 months, just 42% said the online experience saves them time, according to Bain and Google’s “Omnichannel Grocery Is Open For Business” report. The survey polled more than 8,000 grocery shoppers nationwide. The convenience factor contributes to the low penetration rate of online grocery shopping in the United States, which currently hovers at 3%, the study revealed. Just 25% of respondents said they used an online grocery service in the last year, and only 26% of those users — or 6% of all consumers surveyed — reported that they’ve been placing online orders more than once a month. "Online grocery shopping in the U.S. trails that of other e-commerce categories in large part because our grocery shopping habits are so deeply ingrained, and online grocery retailers haven't yet convinced customers that grocery shopping online can be a better experience," said Stephen Caine, a leader in Bain & Company's retail practice. "Traditional grocers have decades of experience optimizing their physical stores to align with how shoppers think — training them to navigate store shelves to easily find what they are looking for, making it easy for them to make trade-offs between products, and providing inspiration when they want to try something new,” he explained. “Online grocery shopping has not yet found a way to digitally replicate these cues simply and intuitively." When it comes to buying groceries online, the Bain/Google study defined convenience as saving time and an intuitive, seamless shopping experience. But for a lot of customers, especially those new to online grocery shopping, that hasn’t been the case. Indeed, Bain and Google found that of respondents who shopped for groceries online three times within the past 12 months, 63% said buying groceries online saved them time versus a trip to the store. The percentage of shoppers agreeing that online grocery is a time-saver rises slightly among those who have done so four or five times in the past year and approaches 70% at six to 10 or more times. Customers who regularly shop a particular grocery store are highly likely to make purchases with that same retailer online, according to the study. When respondents who hadn’t used an online grocery service in the past 12 months were asked which one they’d try first, 96% cited a traditional brick-and-mortar retailer for home delivery. Eighty-five percent said they would select a store they already visit, while 11% said they would use another omnichannel grocer and 4% an online-only retailer. Seventeen percent of those polled said they’ve tried a new retailer in their area in the last three months, and 25% indicated that they’re likely to try a new retailer for a routine grocery trip. "Winning a first trial is so important because there is a general consumer 'stickiness' when it comes to online grocery. Seventy-five percent of online grocery shoppers say they are still using the first online grocer they tried," noted Michelle Paratore, a member of Bain’s retail practice. "Knowing that existing consumers are likely to try their online offering first, omnichannel retailers are well-positioned to keep these shoppers for continued visits and purchases as long as they deliver an experience that is convenient and meets shoppers' needs." With e-commerce penetration expected to at least triple in the next decade, retailers able to provide a satisfying omnichannel grocery experience “have a rare opportunity to edge out their competition,” the Bain/Google report said. "Although the shift online will rapidly accelerate, we anticipate that the majority of grocery spend is still expected to occur in physical stores in 2030," according to Caine. 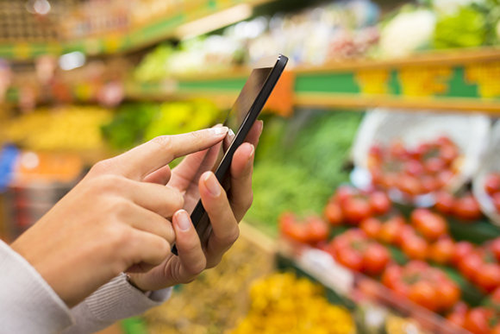 "The winners in this changing grocery landscape will be the retailers that can deliver frictionless omnichannel experiences, investing in digital experiences and tools that save time for consumers shopping online or in the store."